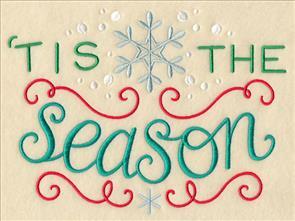 Christmas is only three months away, and these new designs will add a festive look to your holiday preparations. 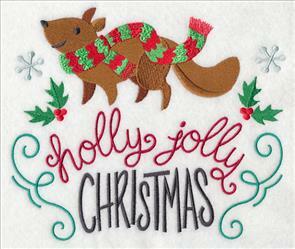 They're a sure-fire way to get into a holly-jolly stitching spirit! 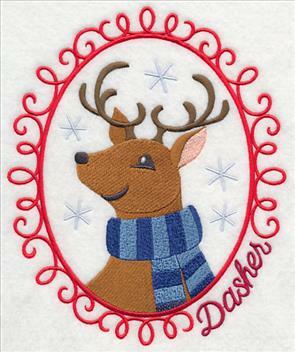 Begin with reindeer cameos and bring a crafty, colorful look to your home and gifts. Stitch the cameos onto stockings, tree skirts, table linens, and shirts for the whole family! 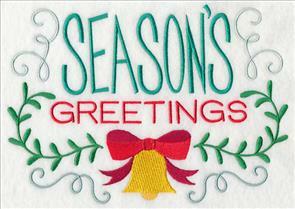 Other new designs include warm Christmas greetings and bright, vibrant sprays. They're wonderful on gift bags, wall hangings, and shirt fronts. Santa's team of reindeer are each framed in festive and graceful cameo frames. The names of the reindeer are part of the filigree! 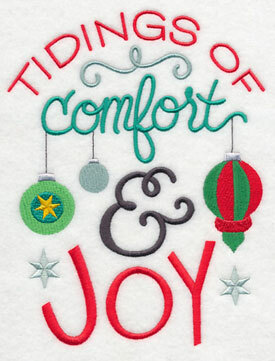 They'll be wildly popular on stockings, tree skirts, quilts, and wall hangings! As the song says, "You'll go down in history!" 6.49" x 7.81" and 5.86" x 7.06"
6.48" x 7.80" and 5.86" x 7.06"
4.87" x 5.86" and 3.23" x 3.89"
Use the whole herd to make an adorable set of dish towels, or a crafty wall hanging. Tuck the smallest size on the left chest area of a shirt, and make coordinating outfits for the whole family. 4.86" x 5.85" and 3.21" x 3.86"
The starry background adds a magical look. We stitched the stars in a light icy blue, so they look a bit like snowflakes. Choose gold thread for a sparkling night sky, or metallic thread for extra shine. The 7th member of Santa's team is sometimes known as Donner, and sometimes called Donder. 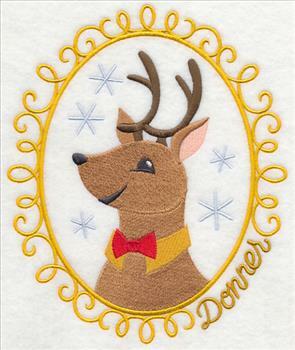 "Donner" is the reindeer from the song Rudolph the Red-Nosed Reindeer. "Donder" is from the poem A Visit from St. Nicholas. They're both the same deer, but the spelling is different. You can read more about Donder/Donner, a reindeer of many names, in this article. Both spellings are offered so you may choose the one that you prefer for your project. 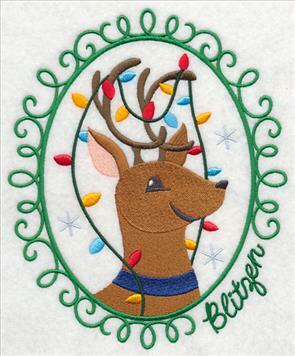 Blitzen, wrapped up in a string of lights, adds a colorful look to aprons, shirts, and stockings. 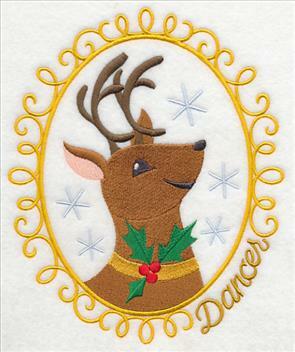 And, Rudolph with his nose so bright, will add a very merry look to tree skirts, gift bags, and wall hangings. Santa Claus is ready to lead his team on Christmas Eve! He's tucked into a cameo with his name in filigree, blending beautifully into the frame. 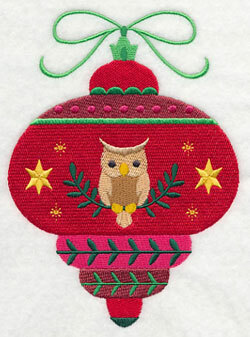 Add to stockings, tree skirts, table runners, and more! 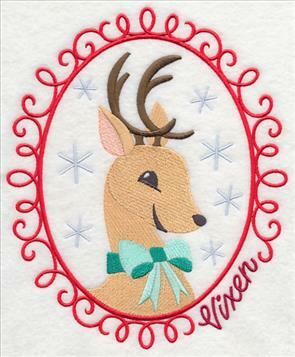 4.87" x 5.86" and 3.21" x 3.86"
Reindeer cameos add crafty Christmas charm to your projects. 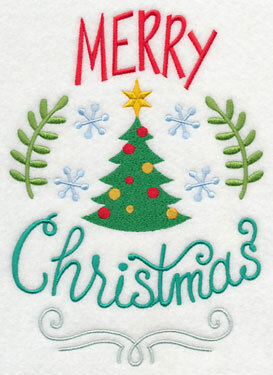 Add them to kitchen towels, placemats, quilts, wall hangings, stockings, tree skirts, and more! Order designs singly by clicking the links above. Or, get the whole herd (and Santa!) in a design pack. Sweet and sentimental messages are paired with woodland critters. These designs are charming additions to aprons, gift bags, and shirt fronts. A moose in a hat and scarf is wonderful motif for the front of a sweatshirt. 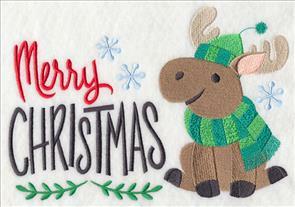 And, the merry and bright reindeer is adorable on cozy blankets or fleece jackets. 7.81" x 6.51" and 7.05" x 5.88" and 5.85" x 4.88"
A woodland fox and festive owl give their Christmas greetings! 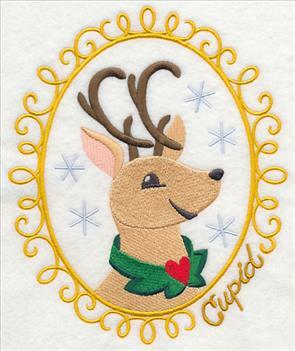 These designs are delightful when stitched on fleece blankets and scarves, gift bags, and towels. 5.83" x 7.60" and 4.86" x 6.34"
Bright little bluebirds chirp festive greetings, while a squirrel in a scarf wishes everyone a holly jolly Christmas. These designs are colorful additions to placemats, table runners, tree skirts, and cushion covers. 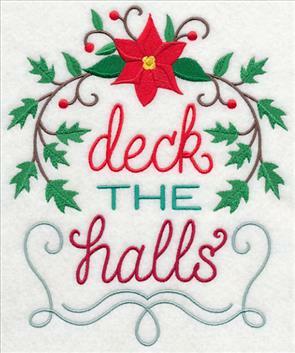 7.80" x 6.70" and 6.83" x 5.86" and 5.67" x 4.87"
Deck the halls with boughs of holly and a bright, pretty poinsettia! Either of these designs are wonderful additions to gift bags and kitchen towels. 5.86" x 7.60" and 4.84" x 6.27"
These light and delicate designs are lovely on gift bags and tea towels. They're simple with low stitches and open areas, yet their bright colors make a bold statement on gifts and kitchen decor. 8.31" x 5.86" and 7.80" x 5.50" and 6.89" x 4.86"
A classic Christmas tree, with warm holiday wishes. Colorful and festive with sleek pine boughs serving as fashionable laurel! 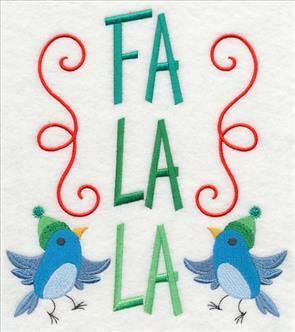 Whether you say "merry" or "happy," this design will be a colorful addition to tea towels, wine bags, gift bags, fleece scarves, and stockings. 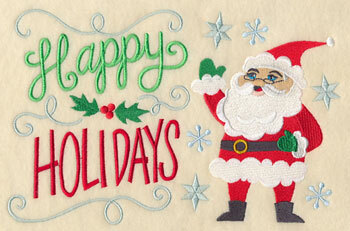 5.60" x 7.80" and 4.83" x 6.73"
Santa wishes all a most happy holiday with this design. Holly, snowflakes, and swirling lines are combined together into a festive motif. 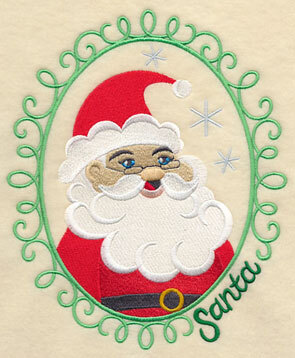 Stitch the Jolly Old Elf and his classic message onto shirt fronts, quilt blocks for door hangers, and towels. 8.90" x 5.86" and 7.81" x 5.14" and 6.86" x 4.52"
Add holiday charm and cheer to your gifts and decorations! These designs are wonderful additions to your gift list and decor. Add them to tea towels, aprons, shirt fronts, stockings, and more! Elegant and graceful sprays are a festive addition to many projects. Add them to the fronts of sweatshirts, or the backs of jackets and fleece vests. 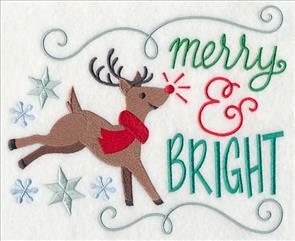 Stitch them onto aprons, table runners, and more, for a classic Christmas look! 11.70" x 4.70" and 9.41" x 3.78" and 7.80" x 3.13" and 6.86" x 2.76"
A Christmas tree is oh-so-elegant with glorious whirls and swirls. Background filigree is reminiscent of mistletoe and holly berries. A beautiful design for tea towels, bolster pillows, and shirt fronts. 11.70" x 5.56" and 9.41" x 4.47" and 7.80" x 3.71" and 6.86" x 3.26"
A colorful trio of ornaments is a perfect fit for the yokes of shirts and jackets! This design is a lovely blend of classic and contemporary: the bulbs are classic shapes and imagery, posed against a fashion-forward background of filigree swirls. 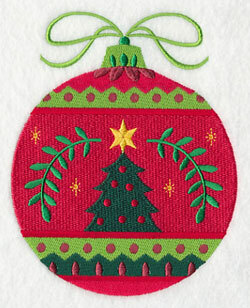 11.70" x 4.69" and 9.41" x 3.78" and 7.80" x 3.13" and 6.86" x 2.75"
Decorate tea towels, aprons, pillow covers, and more with this ornament and pine boughs design. We stitched the sample in traditional green, red, and blue; experiment with different color combinations to find one that you like best! 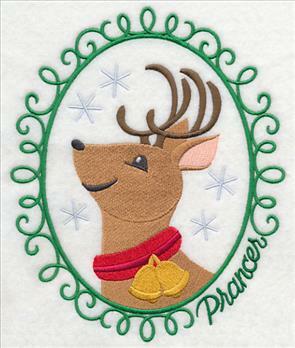 11.70" x 4.98" and 9.41" x 4.01" and 7.80" x 3.32" and 6.86" x 2.92"
Ring in the Christmas season with embroidered towels, totes, placemats, and more! 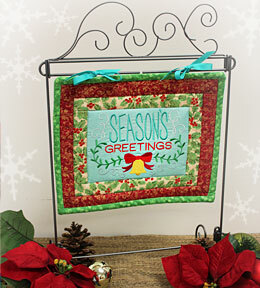 A pair of ringing bells, framed with winter greens, is a traditional and festive addition to holiday decor. 11.75" x 4.43" and 9.40" x 3.54" and 7.79" x 2.94" and 6.85" x 2.58"
Add splashes and dashes of Christmas colors to your projects and decor. 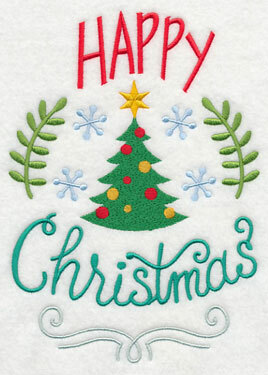 A group of gifts against elegant whirls and swirls adds Christmas charm to gift bags, shirt fronts, and cushion covers. 11.70" x 4.15" and 9.41" x 3.34" and 7.80" x 2.77" and 6.86" x 2.43"
The above designs add color and charm to your Christmas gifts and decor. They're a great shape for shirt fronts and yokes, as well as towels, aprons, and placemats. Order the designs singly by clicking the links above - or get all six in a design pack! Whoooooo loves Christmas? 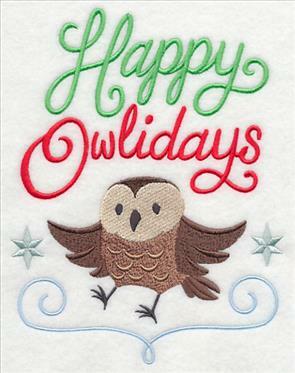 This holly-jolly owl is all dressed up and ready to wish you a very merry holiday! He's sweet on sweatshirts, the backs of fleece vests, towels, and more. 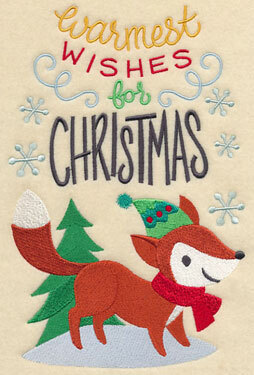 11.75" x 4.82" and 9.40" x 3.85" and 7.80" x 3.21" and 6.85" x 2.81"
A charming woodland fox is surrounded by pine boughs and candy canes. This design is a nice fit for a sweatshirt front, bolster pillow, and towel set. 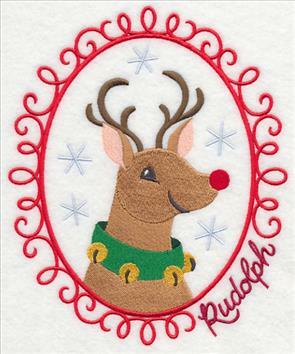 11.65" x 4.42" and 9.42" x 3.58" and 7.79" x 2.96" and 6.87" x 2.61"
Rudolph the red-nosed reindeer is bedecked and bedazzled with colorful ornaments. He'll be a favorite on shirts, placemats, and towels! 11.70" x 5.09" and 9.41" x 4.09" and 7.80" x 3.39" and 6.86" x 2.98"
Christmas cardinals invite you to meet them under the mistletoe! A pair of bright birdies hold a sprig of the kissing plant against a backdrop of greenery and swirls. Lovely on pillows, blocks for wall hangings, shirt fronts, and the yokes of shirt backs. 11.75" x 4.19" and 9.41" x 3.36" and 7.80" x 2.79" and 6.86" x 2.45"
This little squirrel is all dressed up in his holiday best! Sporting a Santa cap, he keeps a careful watch on his acorns. This blend of Navidad and Nature brings a clever touch to shirts, placemats, aprons, and towels. 11.70" x 3.75" and 9.41" x 3.02" and 7.80" x 2.50" and 6.86" x 2.20"
Stitch this friendly fellow onto a shirt, and everyone will know that somebunny loves Christmas! He's charming in a striped scarf, and beautifully posed against a backdrop of holly. 11.69" x 4.61" and 9.41" x 3.71" and 7.81" x 3.08" and 6.85" x 2.70"
Add a festive and fun look to your holiday gifts and decor with these designs! You can order the designs singly by clicking the links above, or get the all 6 in a design pack! Stitch ornaments onto stockings, pillows, and towels. 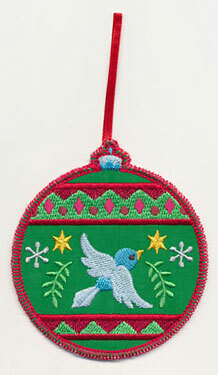 Then, make a coordinating ornament, right in the hoop, to hang on the tree! Six classic and woodland themes are shown below. Begin with a wise owl, perching on a pine bough. 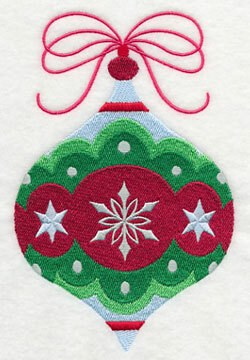 Embroider the stitch-filled design (below, right) onto towels, gift bags, and stockings. 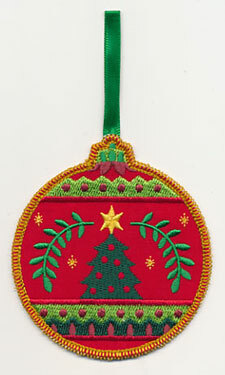 Then, attach the coordinating in-the-hoop ornament (below, left) for an extra-special touch! If you're new to making in-the-hoop ornaments, click here for a tutorial! 4.84" x 6.64" and 2.81" x 3.87"
Rudolph leaps and frolics on this ornament. Dots and snowflakes add appeal. 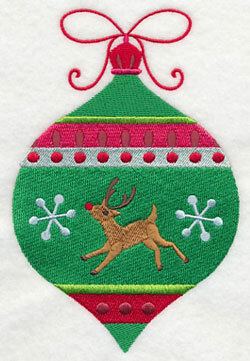 The left is an in-the-hoop design; use it to construct an ornament as you stitch! 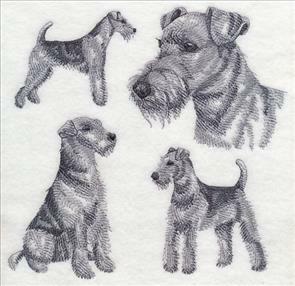 The design on the right is a stitch-filled one that can be embroidered onto fabric. Use it to make wildly fashionable pillows, placemats, and towels! 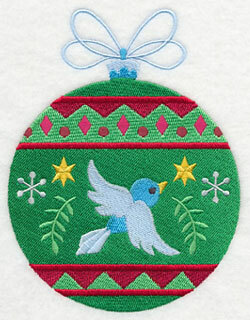 4.54" x 6.86" and 2.55" x 3.87"
A sweet little bluebird brings Christmas wishes to your holiday projects. 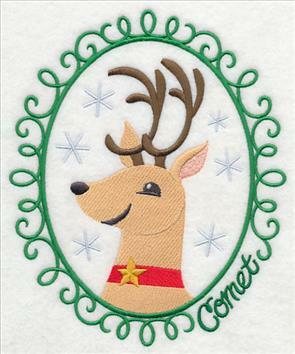 Embroider the stitch-filled design (below, right) onto towels, stockings, and other items. 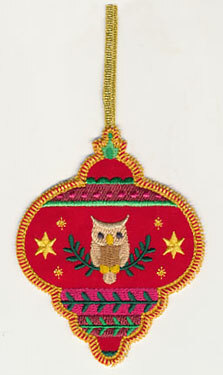 Then, make a coordinating ornament in the hoop (below, left). The two together make a lovely gift! 4.85" x 6.29" and 2.97" x 3.86"
A bright yellow star tops a classic Christmas tree! This design is a beautiful accent to hand towels, stockings, door hangers, and more. 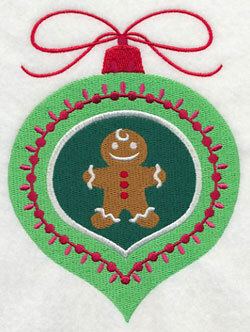 Embroider the stitch-filled design (below, right) onto towels, stockings, and other items. 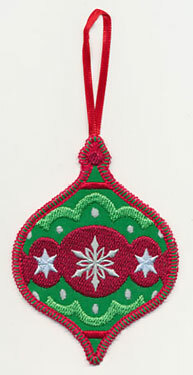 Then, make a coordinating ornament in the hoop (below, left). Pair together for a gift that will be treasured! 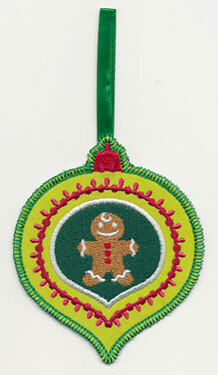 4.86" x 6.05" and 3.10" x 3.87"
A sugary-sweet gingerbread cookie is a delightful addition to any tree - and kitchen towels, too! The design on the left is an ornament that can be constructed on the machine in the hoop. The design on the right is a stitch-filled one that can be embroidered onto fabric for delicious pillows, towels, and placemats. 4.86" x 6.34" and 2.96" x 3.86"
The pattern on these ornaments is reminiscent of Nordic sweaters. Classic Christmas reds and greens are made a little frosty with the addition of icy blue. The design on the left is the ornament that is made in the hoop; the design on the right is one that can be stitched onto fabric to enhance your Christmas decor. 4.43" x 6.85" and 2.49" x 3.86"
The breed of dog that's the nearest and dearest to Marilyn's heart is the Airedale. 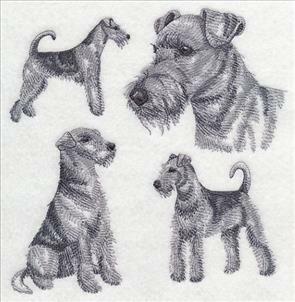 And, she loves the light sketch medleys that we've been making of the different dog breeds. She requested an Airedale in that style, and we are happy to oblige! The "request of the week" program is one where you can request a specific design for us to draw and digitize. It's a popular program, and we're booked up through 2015, and a bit beyond. The queue is filled to the brim with creative ideas - but we're always happy to have more. 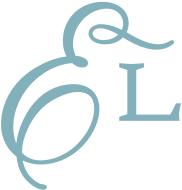 You're welcome to send your design ideas to us: support@emblibrary.com. 7.78" x 7.49" and 7.15" x 6.89"
7.78" x 7.45" and 7.19" x 6.89"